Guess who is back from hiatus, posting a new eye set. Have you cried your eyes out, trying in vain to forget the ghost of yesterday? worry no more - because here are seven new eyesets from Flan, to fill up the empty eye sockets. 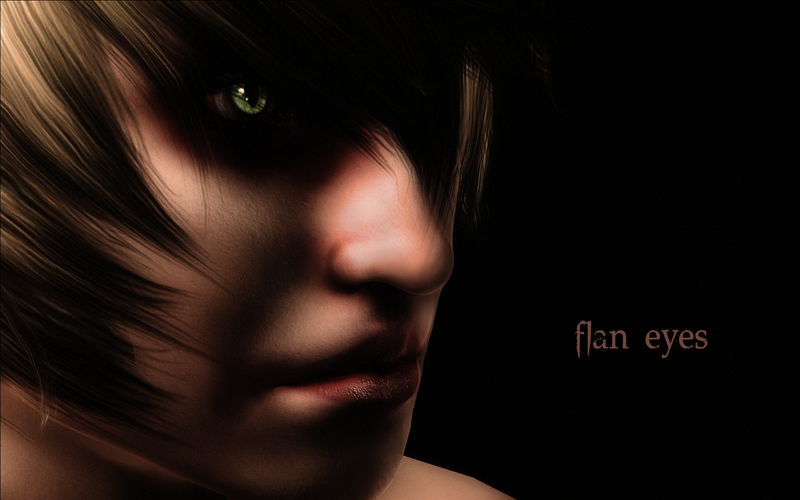 Seven sets of sinful eyes made by Flan during october and december. Wut. I'm a slowpoke. Didn't you know? Now you know. Go away like they always do. 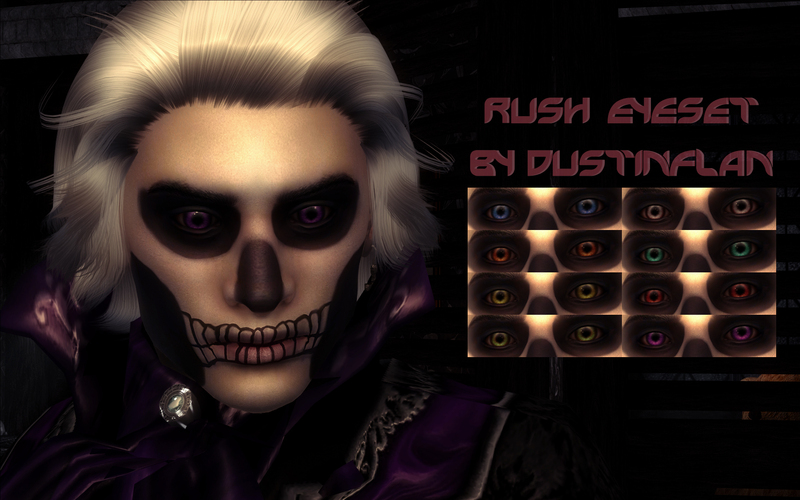 The eyes are for the vanilla eye mesh, and as always, one has to put the eyes in game by themselves. 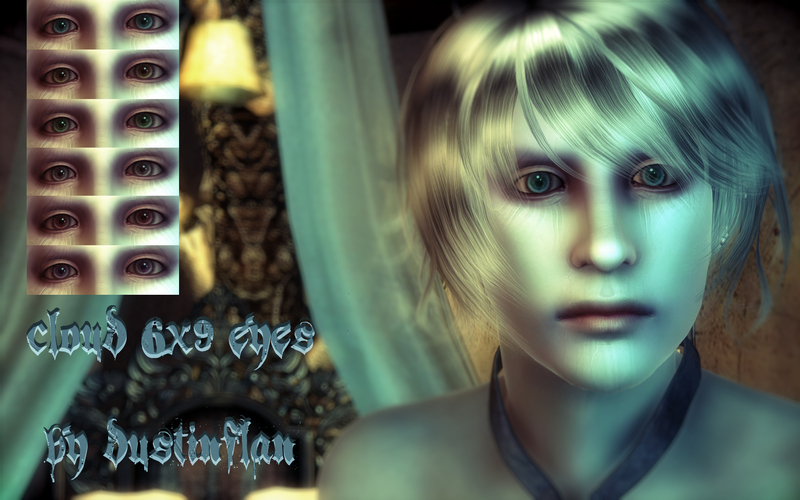 Daniel the Pale Tiefling is proudly presenting Cloud 6x9 eyes - 6 pairs of humanoid fantasy eyes for cold and blue boys. 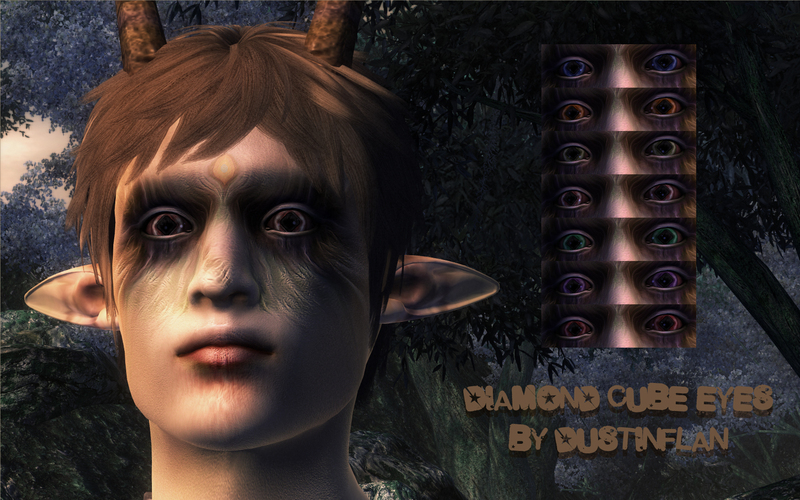 Euchrid the Forest Demon is proudly presenting Diamond Cube eyes - 7 pairs of fantasy eyes with big diamond shaped pupils for feral boys. 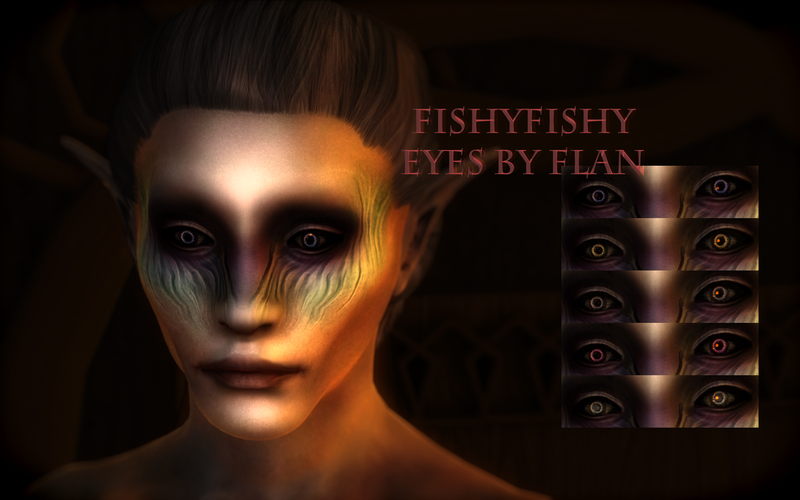 Judah the Shaman is proudly presenting Fishyfishy eyes - 5 pairs of fantasy eyes for drowned radiant boys. 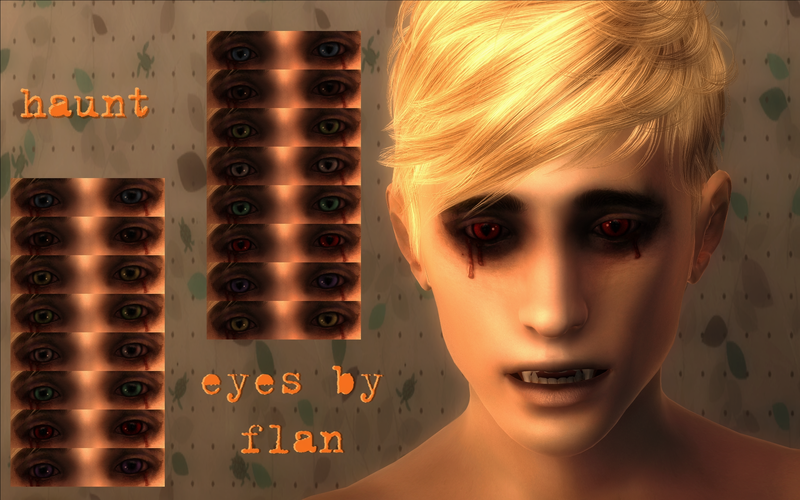 Gill the Model is proudly presenting Haunt eyes - 16 pairs of sore looking eyes for human/elven boys, coming with slit or round pupil shape. 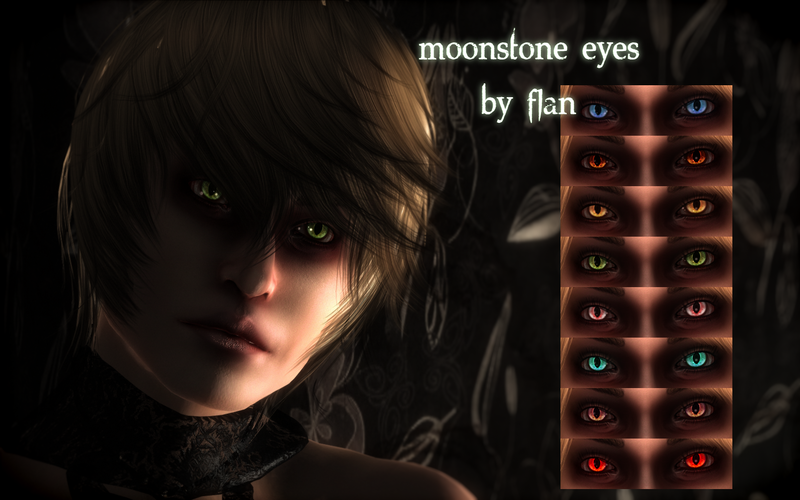 Flan the Undead is proudly presenting Moonstone eyes - 8 pairs of artificially coloured candy eyes with a meaty sclera for eternally dreaming boys. Tate the Model is proudly presenting Rush eyes - 8 pairs of flamboyant eyes for boys who smoke meth and praise satan. 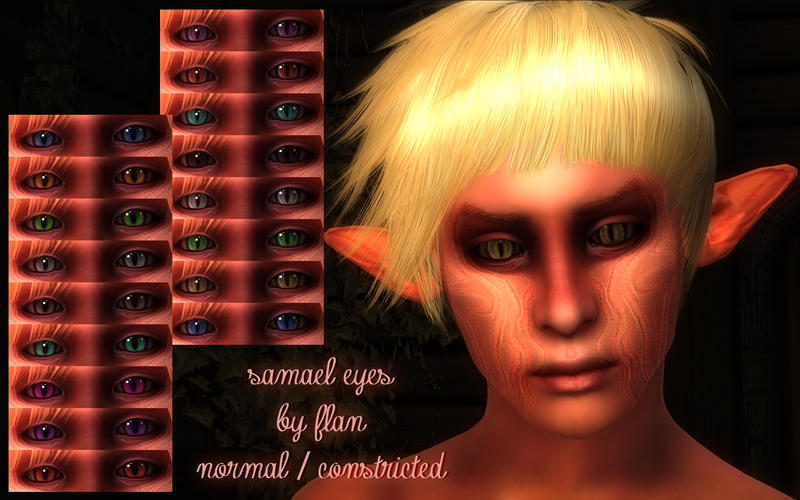 Noah the Burned Tiefling is proudly presenting Samael eyes - 17 pairs of enticing eyecandy eyes featuring slit and very slit pupils for heartbreaking monster boys. and comment if you take - this is polite. and here's a little set named 'afraid of the dark'. pictures of flan, and another pic of max, they are separate this time, looking both so worried. they dont really experience fear, rather the emptiness they embrace instead of each other. staying in the same room in different spaces of time, they only wait for their worlds collide and fuse them together, mix and match like they should be. It's so painful to be without you, to not feel your skin under my fingers. Wonderful eye's set, thank you very much! wow you're welcome people! your the best people in the world :D i love comments! I love these. The moonstone eyes are my favorites.